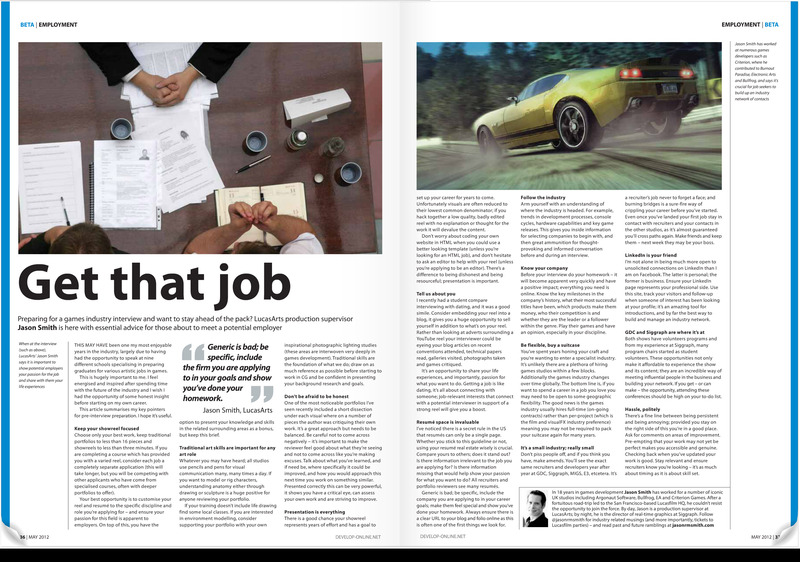 My blog article Breaking into the games industry is in Develop Magazine! Check it out. (ps. They used a stock image for this article; I do not recommend wearing a suit to an interview for an art or animation job unless you’re applying to work for Disney in 1930). This may have been one my most enjoyable years in the industry, largely in part having had the opportunity to speak at a dozen schools specializing in preparing graduates for various artistic jobs in games. This is hugely important to me, I feel energized and inspired after spending time with the future of the industry and I wish I had the opportunity of some honest insight before starting on my own career. This post summarizes my key pointers for pre-interview preparation, I hope it’s useful. Keep your showreel concise and focused. Choose only your best work, keep traditional portfolios to less than sixteen pieces and showreels to less than three minutes. If you are completing a course which has provided you with a varied reel consider each job a completely separate application (- this will take longer, but you will be competing with other applicants who have come from specialized courses, often with deeper portfolios). Your best opportunity is to customize your reel and resume to the specific discipline and role you’re applying for – and ensure your passion for this field is apparent. On-top of this, you have the option to present your knowledge and skills in the related surrounding areas as a bonus, but keep this brief. Traditional art skills are important for any art role. Whatever you may have heard all studios use pencils and pens for visual communication many, many times a day. If you want to model or rig characters, understanding anatomy either through drawing or sculpture is a huge positive for anyone reviewing your portfolio. (If your school doesn’t offer life drawing find some local classes). If you are interested in environment modeling, consider supporting your folio with your own inspirational photographic lighting studies (- these areas are interwoven very deeply in games development). Traditional skills are the foundation of what we do; draw on as much reference as possible before starting to work in CG and be confident in presenting out background research and goals as part of your portfolio.